Phlasa (Grewia asiatica) is a small berry that comes for a short season in summers and we feel lucky if a cart full of phalsa passes by. It is very uncommon to see cartloads of fruits in Delhi now but I go for walks and there are a few areas where fruits are still sold the old fashioned way. Phalsa is not a regular fruit that every corner fruit vendor will stock and sell like the season's best peaches or plums unfortunately. Phalsa has a few takers and very few sellers too. Phalsa berries are not too juicy but once ripe the berries do not last very long. Also this is one of those berries that people like sucking into one by one, sprinkled with some herbed salt so a little phalsa goes a long way. The seed has to spit out and the flavourful but meager amount of pulp makes a nice chatpata snack. One can't eat too much of it like a fruit. But once made into sharbat, you can consume fairly good amount of phalsa in one go. With its wonderful antioxidant and anti inflammatory properties phalsa must be used frequently till the season lasts. Phalse ka sharbat can be made savoury like a jaljeera or a regular sweet version. This season though I experimented with a new recipe of Phalse ka shorba because both of us were down with flu last week and we wanted something comforting for our throats. I made a few more regular shorbas but phalse ka shorba was one of the favourites owing to its novelty and tangy sweet taste. One actually cannot imagine the taste of this shorba as the ingredients used are so opposite to each other that it leaves one wondering about the final bouquet of flavours. Add sugar and salt to the cleaned and rinsed phalsa and leave it for a while. Then mash well and add a cup of water. Strain and reserve the liquid. 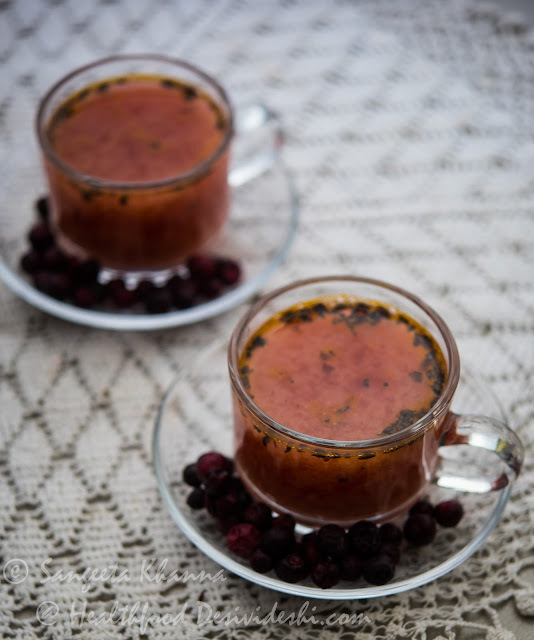 You can blend the phalsa in mixie and strain to get the juices. Now heat mustard oil and tip in the heeng and cumin seeds. followed by broken dry red chillies. 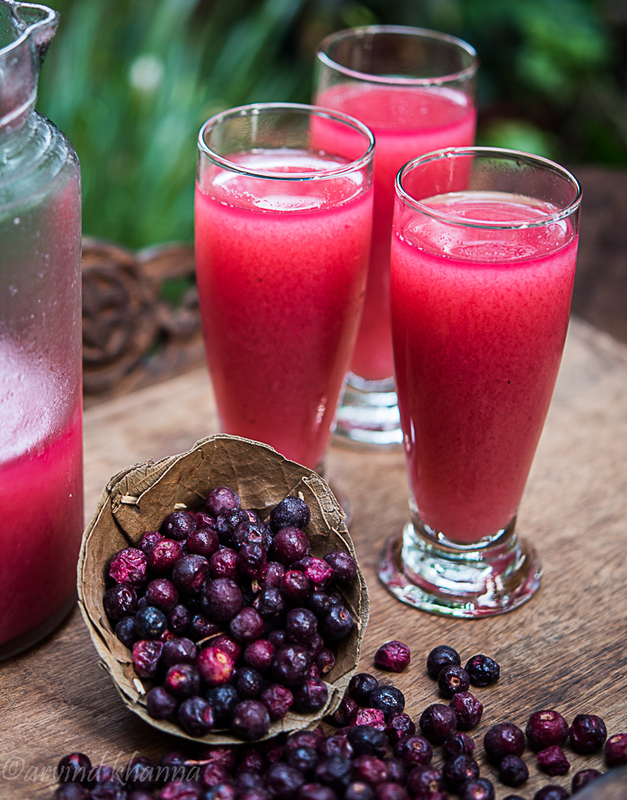 Let them all get aromatic and then pour the phalsa juice along with ginger powder and pepper. Add more water to make the shorba about 600 ml or enough for 2 servings and simmer for 5 minutes. Pour into teacups as this shorba is better sipped slowly like tea. Please don't replace mustard oil if you can. If you don't have mustard oil you can use butter. The flavours of heeng, cumin and ginger together gives this soup a real kick that staves off all the discomforts of flu. The shorba is great even if you don't have flu as we repeated it many times this summer. This became a way to drink more liquids and we loved it served warm. With all the ingredients that help healing this soup becomes a wonderful anti inflammatory soup that works in summers too as one is always dehydrated, always exhausted for no apparent reason. 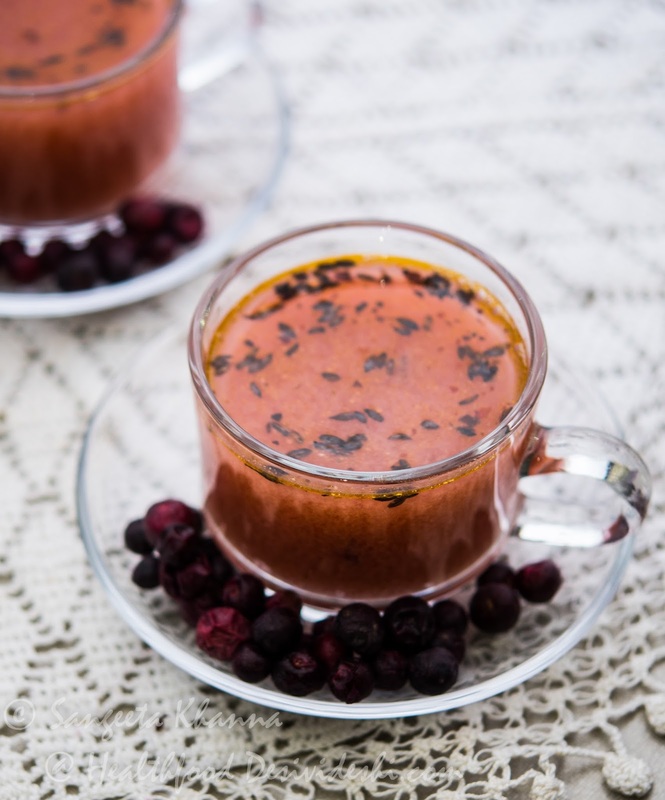 Try this if you are getting phalsa in your part of the world or use any sweet and tart berry to make this soup and let me know how you like it. The flavours are very typical of Banaras let me assure you. I will share a few more shorbas we tried this summer. Stay tuned. Phalsa ... it looks like the wrinkled, red, Baer Fruit. Is it the same one. At first glance , I though it might be aged Karonda. I had almost forgotten this treat. Tangy treats after school sold outside school gates by tired vendors to tired kids. Sold alongside seasonal fruits like Guava, wood apple Bhael, sweet large green and tiny ,tangy red Baer, Phalsa, Karonda, amla, totapuri mango, green mutter. Aah the delights of per-processed food industry. My, we were fed well.. and fed by locally grown seasonal fruits.... The kind that you write about in your carefully researched and beautifully pictured articles. You are an artist , painting from food memories. I did not know half the names of all these local fruits and berries, that I had eaten decades ago, until you wrote about them. Karonda is one such, from my elusive memory. It was small berry like fruit, which turned your mouth and fingers beetroot red- after eating this ,I was afraid to go home and face my mother, possibly why I avoided eating it. Is it the same one? or maybe its the beetroot mauve inside of some local raw tamarind. Thank you so much Kamal for writing in. 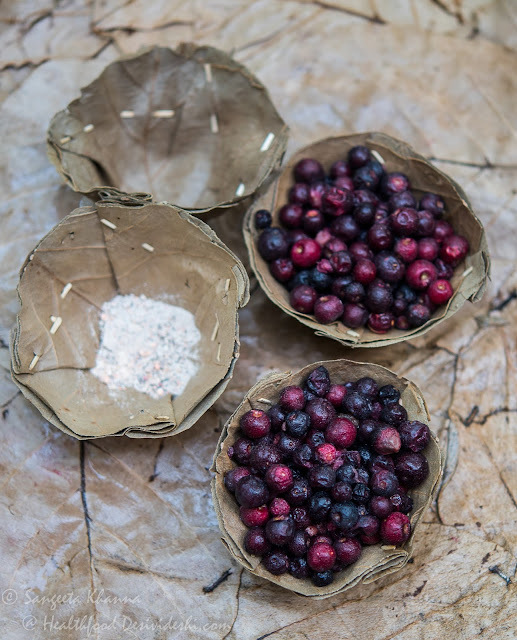 Phalsa is different from the purple karonda, the taste profile is of the berry family but it had a large seed inside with very little flesh enveloping it. So glad to read about your food memories too. Yes the processed food industry has killed our taste buds indeed.